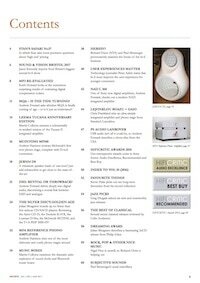 We have twelve product reviews, starting with Chris Frankland assessing the unusual and intriguing Lejonklou Boazu and Gaio electronics, a phono stage and integrated amplifier with a surprising performance. Andrew Everard digs in deep into the DSD formats , covering all bases and rediscovering the innate analogue simplicity of one of the routes to D/A conversion. Peter Aylett teaches us about connectivity and operability of our audio systems and the continually advancing man machine interface. 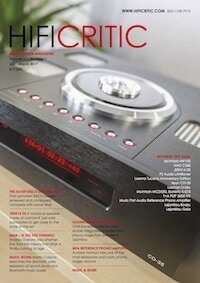 Richard Dunn and our Editor muse on the evolution of Hi-fi separates and ponder on the future. We present the 2016 Awards listing, with many important newcomers. We have also compiled the index to last years reviews and features, equipment and music. Paul Messenger falls in love with a semi cylindrical cast iron miniature loudspeaker the Jern14 DS, which enjoys some necessary augmentation from a couple of purchased compact sub woofers. Music First Audio has charmed the aural socks of Andrew Harrison with their new phono equaliser, here boosted by their transformer step up. 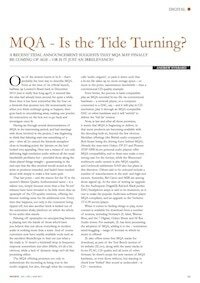 Clearly in prime feature mode Andrew Everard dives head first into a multiplicity of timely MQA topics. Andrew also studies the performance of the NAD C368 digital versatile integrate amplifier, and is intrigued by the results obtained. Meanwhile Jason Kennedy has assiduously chased round the Bristol Sound and Vision Show and brings some highlights from this annual event. Stan Curtis pens his usual thoughtful feature on audio topics, this time musing on the high cost of modern higher end audio. Loving his digital bits Andrew Everard then has a go at assessing with the PS Audio LanRover, a low jitter, quality improving digital link for USB audio chains. Martin Colloms has a rant about the plethora of noisy music boxes, usually Bluetooth connected that are proliferating in our stores, noting their sound and their design. Colloms also digs in deep with the latest Leema high power integrated amplifier the Leema Tucana II SE, includes lab testing, and has a ball. 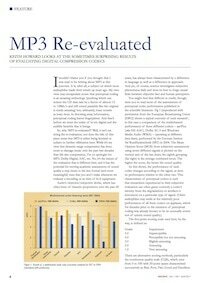 In keeping with our enhanced digital audio content Keith Howard looks at new research on the audibility of MP3 audio coding once claimed to be the gold standard for lower cost players and for streaming. Julian Musgrave has heroically assembled £60,000 worth of upper echelon SACD/ DSD players, from Ayon, Luxman, Mcintosh, T&A, and Esoteric and comes to some unusual conclusions about musicality, and not least the group test winners. 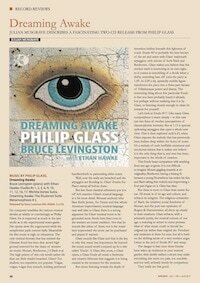 Julian Musgrave also pens a Feature review on the new recording of Philip Glass, his recent Piano Etudes, this a double CD release. 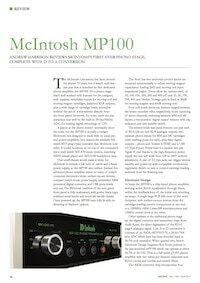 Meanwhile Andrew Harrison continues his phono equalisation investigations with a review of a new McIntosh phono preamplifier, the MP100 which boasts analogue and digital processing. 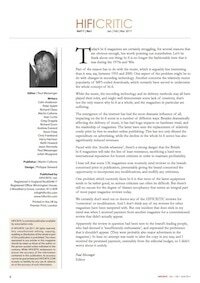 For music content we have many Rock, Jazz and Classical reviews, while the issue finally closes with Paul Messenger’s column Subjective Sounds. A recent Tidal announcement suggests that MQA may finally be coming of age – or is it just an irrelevance? Keith Howard looks at the sometimes surprising results of evaluating digital compression CODECS.